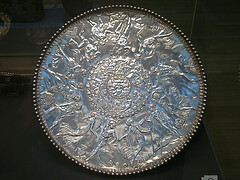 Silver dishes were in fact a status symbol, and a most valued gift some kings presented to important vassals, specially after the discovery of America increased the disponibility of this metal. Kings, nobles and even rich American bourgeois (as referred in a tale by Alejo Carpentier) used to travel with their silver services. Even when Charles IV and Ferdinand VII of Spain were in France, after they had resigned their crown to Joseph Bonaparte, Napoleon took pains to get their silver service and send it to their residence in France, even if they never got it, as "Pepe Botella" took it as a part of his booty. But important as richness can be, it is even more important to show you don't care; at least it was so for Spaniards in those days when they earned the fame of liberality (not to say extravagance). So it was with Iñigo López de Mendoza y Quiñones, second Count of Tendilla (1442-1515). In 1486 he was appointed ambassador in Rome by Fernando el Católico. During a feast he offered to the Pope's Curia, as soon as silver platters were dirty, he commanded to throw them into the Tiber, and replace them by new ones. But he had secretly placed fishing nets in the river, so by night his servants could recover everything but a spoon and two forks. In 1808 Charles IV and Ferdinand VII of Bourbon, father and son, Kings of Spain abdicated due to the Napoleonic invasion of Spain. Napoleon appointed Joseph Bonaparte, his older brother king who resided in Madrid from 1808-13. He was called “Pepe” (the nickname for Jose or Joseph) and “Botella” (bottle, insinuating that he was an alcoholic). He was not an alcoholic. Some reports are that he was abstentious but one of his first acts as King of Spain was to rescind the law on taxation of alcohol. Then he took measures to liberalize the hours when wine shops could be open. In 1813 he had to flee when the Duke of Wellington invaded Spain. In flight he lost his Spanish booty consisting of crown Jewels and artworks. He moved to Philadelphia where he lived in a mansion with an American mistress from 1813-1844. His wife stayed in France with his daughters. In 1844 he received permission to live in Florence to where he died the same year and was buried in France. The show of wealth has been important in Spanish history. Following American conquests, several from Trujillo in Extremadura, western Spain, built palaces in their hometown. They were equipped with unique corner window-balconies large enough for a throne chair where the lord of the house would sit wearing jewels brought from South America as seen in the Palace of the Duke of San Carlos. Until recently, practical presents were not given to aristocratic brides as wedding presents as it was thought that if wealthy enough to marry the groom could provide whatever was needed that did not come with the bride’s trousseau. Proper presents included very costly of silver trays, lamps, serving dishes, bowls and platters. I fear "posh" brides keep the habitude of receiving costly silver gifts, as they include them in the "wedding lists" from which the guest are constrained to purchase. Have you ever heard that American mistress of Joseph Bonaparte was Pocahontas' descendant and they had children, so there should be a branch of Bonapartes in the USA? I have read it somewhere, but I am not sure it is just a legend. Not being an "afrancesada" (or French supporter during Spanish Independence war) I have always recognised Pepe Botella had some nice qualities (as the liberalization you write about). The reason why people nicknamed him "botella" was that in those times Spanish despised drunkards(hard to believe nowadays): getting drunk meant loosing self-control, and with it dignity and honour, the most important values in the Spanish society for centuries. So the very worst thing you could say of someone was that he was a drunkard (borracho). Now teenagers speak openly of who has got drunken first during the last weekend in the "botellón" (meeting for drinking directly from the bottle in the street). Oh tempora, oh mores!